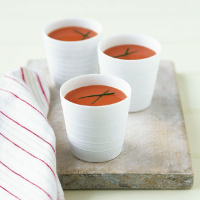 Ripe, seasonal English tomatoes are roasted with red peppers for sweetness and intense flavour in this easy and refreshing chilled summer soup. Preheat the oven to 180°C, gas mark 4. Place the tomatoes, still on the vine, in a large roasting tray, together with the peppers and onion. Drizzle with the olive oil and toss to coat lightly. Bake for 40 minutes or until the vegetables are soft and beginning to brown. Remove from the oven and leave to cool completely. When cold, carefully remove the stalks from the tomatoes and discard. Place the cooled roasted vegetables in a food processor or blender and whizz until smooth (do this in batches if necessary). Pour the mixture through a sieve into a large bowl, pressing through any remaining lumps. Stir in the stock and cream. Season to taste and chill in the fridge until required. Serve cold in glasses or small cups, adding some ice cubes if you like. Garnish with a few snipped chives (optional). Make this soup in advance and chill for up to 24 hours in the fridge.